Supply chain legal issues can have a major impact on driving the profitability of a manufacturer or distributor. Foulston Siefkin attorneys pride themselves on understanding the complex issues involved in receiving, producing, and distributing goods as a single process. 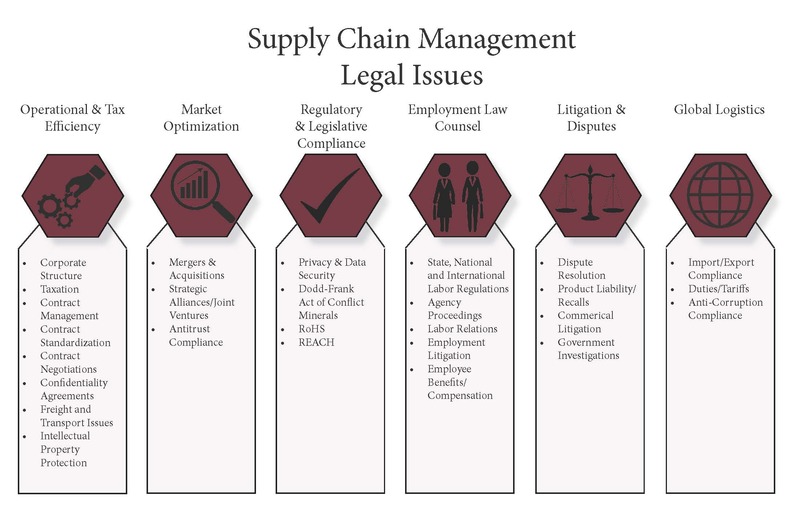 Our attorneys cross practice area lines and work together to apply their expertise to learn the supply chain pressure points and suggest risk mitigation to ensure the supply chain can withstand disruption and can focus on the organization’s desired criteria whether it is speed, redundancy, cost, or other factors. We proactively identify opportunities for risk management and tax efficiency. Our attorneys have extensive experience working with both private and public companies negotiating hundreds of contracts with both our clients’ customers and vendors. If problems arise, we have the resources to preferably prevent costly disputes but when necessary, advocate in court for our client. We also counsel clients on a variety of other supply chain legal issues including regulatory and legislative compliance, strategic alliances or mergers and acquisitions, product liability and recalls, intellectual property protection, import/export compliance, and global logistics. We pride ourselves on our attorney responsiveness which is so crucial in keeping the supply chain efficient.